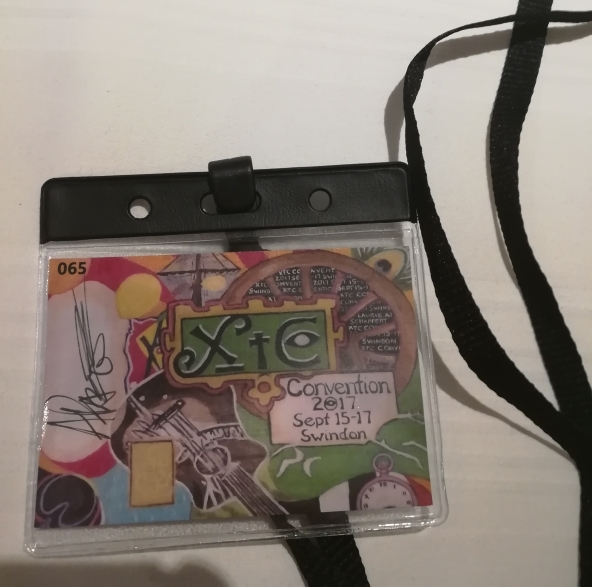 I was fortunate enough to be one of the 100 or so lucky punters to get a ticket for the sold out XTC convention in Swindon and fortunate enough that my house move landed a couple of weeks later than this convention (despite Lammy ribbing me “We’ll end up moving that weekend and you’ll have to miss you’re beloved XTC”!). I have to declare my hand early here and confess that I was very late to the XTC party, not really fully discovering them until the late 90s. Whilst I was merrily picking my way through their discography and discovering all the delights that it has to offer I was missing the demise of the band and didn’t really discover Apple Venus and Wasp Star until Messrs Partridge and Moulding had firmly shut the door for the last time at XTC towers. So I wasn’t going to let the convention pass me by. A ticket was purchased for less than £30 for a full weekend of XTC fun and before I knew it I was making my way down the M1 then flooring it (don’t do it kids!) on the M5 to meet with fellow XTC mates Owen and Jacquie for a curry then on to the Friday night events. Arriving at the venue we were warmly greeted by the organisers and what a great bunch of people they are. They welcomed everyone on the way in and gave us all a goody bag with programme of events, badges and the weekend pass (each one signed by Andy Partridge). We got seated then split into teams for the XTC quiz. I think I managed to get about 3 questions right out of about 30. They were really nerdy, more so than the Stranglers convention I’d attended a few years earlier. But it was all jolly good fun and that continued with a tribute band and an open mic session. Easing us in nicely for the weekend’s events. Fairly early start, fed and watered and ready to go we have a lot to get in today. Starting with a walking tour of Swindon and pointing out the various XTC landmarks. This was great and incredibly organised. A lot of prep had gone into this and it showed. At times I felt it would’ve made a great Radio 4 documentary, those quiet moments walking in between sites and the bit where a local cyclist passes by and goes “What are you lot doing?” “Oh we’re doing a guided walk” …”What?! of Swindon? This dump” (says the local!) …”Yeah it’s for a band who were based here”….”Oh XTC? Enjoy” and off she cycles. We continue taking in various band members houses (admired from a distance) , music stores the band would frequent and such like. Back to the venue and there’s a raffle. I don’t win anything but it’s great watching people jumping up and selecting an XTC goody. Again it’s such great value I can’t imagine any of the organisors profited off this (not that was the intention) and they clearly spent a lot of time and effort and investment in raffle prizes, treats on the table and even champagne! to toast the Bumper Book of Fun book launch. A bit later John Moorish takes us through a slideshow and the XTC early days story. Most enjoyable and entertaining. What follows is an XTC discussion with various long standing fanzine and XTC authors. Mark Fisher then launches his XTC Bumper Book of Fun we all raise a toast and it’s a fantastic collection of XTC fanzine editions and refreshed with interviews with comedians (what is it about comedians liking XTC?) and various other bits and pieces. The venue now goes a bit silent. Messers Moulding and Chambers are en-route! They walk into the venue, everyone applauds, they smile and wave. There’s a lot of love in the room. A queue forms and you can get records signed and have a chat. I have a brief chat with both Colin and Terry. Terry is so down to earth, you wouldn’t think he was bashing the crap out of the drums on many of the pivotal XTC albums. Colin as well is charming. Top blokes. There’s a walking tour of the Uffington White Horse. It looks great and initially I was up for this but knowing I’m moving house next Fri or the Fri after (it was the latter in the end) I decide to head back up t’ut North! to pack boxes. But it’s been a complete blast! Geniunely a great time was had by all. Thanks again to everyone involved who made it a weekend I won’t forget. Here’s a little sneaky peek into the Bumper Book of Fun – well recommended…..